Seemingly Italy wanted more than Forgotten Tomb, so it gave us another fine black doom band. As the previous Journey Through The End Of Life already hinted, Beatrik added a great deal of funeral doom to the new album. While still incorporating the spirit of black melancholy and agony, the band expanded it sound with a total funeral atmosphere. The depressive and melancholic black metal passages are still present, together with some flares of nature oriented beauty. For an album to remain interesting, it must either be different from the previous works, or better. In this case, I feel both apply. Requiem For December sounds somewhat more original, yet not as good at first listen, for it takes some time to get into. The black half of Beatrik descends from the line of Burzum. Natural elements are combined with heavy melancholy and desperate vocals. On this record, the vocals are seriously adapted to the funeral doom style that for the first time takes the bigger half of a Beatrik album. The vocals are lower and the typical BM-pitch is entirely gone. The band seems easily compared to Forgotten Tomb now, but also to Forgotten Woods on tracks like Eternal Sleep, where nature shone its gravid light upon. Requiem Of December takes the listener through a landscape of the process of dying. Agony, melancholy, hate, depression, it is all present, resulting in a strong atmosphere of the procedure to be taken six feet under snowy ground, a winter burial in solitude. Some fragile acoustic passages shine like split beams of a cold sun upon the music’s already lost soul. Deep melancholy and esoteric beauty. The production should be no ones problem; not too raw, and not too clean. The guitar sound is heavy and not buzzing. For some reason Deinonychus immediately comes to mind when describing the guitar sound, but also Evoken found its share in some of the funeral doom parts. Plodding drums back up the album, half of the time in a slow funeral tempo, elsewhere on semi-fast black metal speed. The mix is pretty fine and the album does not easily bore, it is definitely a good release, and however this is not a unique piece of art, its melancholy might be refreshing. If you can take the time to get into this release, then it will certainly keep you listening for a while. For fans of black/doom or depressive black like Xasthur, this will be a nice pick. 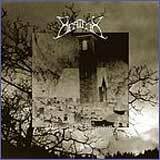 For one that does not have funeral doom very high, Beatrik’s debut might be a better choice.